One thing I do remember about my grandmother was that she was extremely loyal, to her husband, to family and to her friends. My Grandfather must have never doubted her as she followed him to a very remote area to break in land for a farm, she took on his Polish/German grandmother who did not speak a word of English, who by all accounts was slipping into dementia. There, she produced 4 children in a space of 6 years. She must have had great love for him to do that, as she came from a prosperous farming family who had come out to NZ in one of the first settler boats. In photos that I have seen of her as a young woman she looked rather stern and plain, but I know she had a romantic side to her and great compassion. I remember her always wearing pretty flowery dresses, and her scrap books were full of flowers and pretty things. I did her in pastel first as I wanted to portray her as a young pretty romantic girl, I know that she was that in her heart. 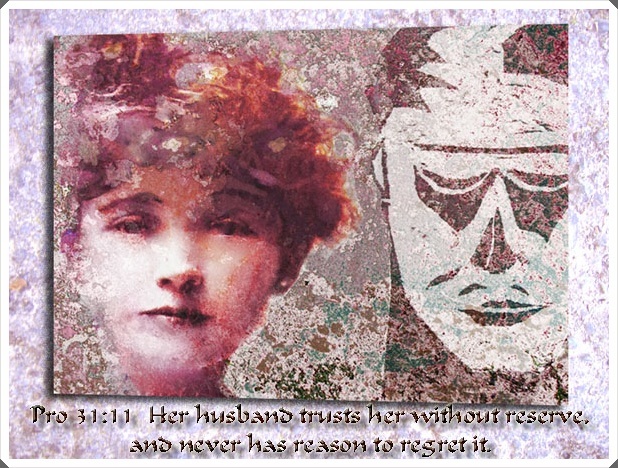 The processes for this picture were a pastel of the young Alice, A woodcut of the Husband, and a photograph of concrete. Then I played around with them in Photoshop. Wow, what great memories and she sounds like such a inspirational woman. Love the art piece too! Happy PPF! Wonderful tribute, she was beautiful and delicate! !You may have felt like you were plaint but youth really is so beautiful. And rarely seen as so until it's too late! I suspect your grandmother saw the true beauty of her granddaughter!! There probably was heaven in your eyes! I see the sparkle now...I can only imagine what they were like when your were young!! Your talent as an artist is so beautiful to see. And I can't imagine you ever being plain! I want to give my grandchildren something to remember. I believe grandparents have a responsibility to their grandchildren. Mine are raised in a dedicated Christian home, but I still try to give them a blessing when they visit. Thank you all for your comments, the 'plain' was because I have an astonishingly beautiful sister, and grownups often don't realize little pitchers have big flappy ears! It is a tape that I managed to break in my thirties, but sometimes it still rears it ugly head! I believe Grandparents have a role to pick up on things that parents miss out on in the hurly burly of life. Bless you all. I don't understand the concept of 'plain' because to me 80% of people (especially young ladies) are beautiful, and the rest are not only because of illness or misfortune. Too bad so many buy into the toxic hype that some are pretty some are not!! iN any event, just love your work - she to me looks very beautiful and Photoshop is a great medium for putting these together! I love the contrast between the soft pastel and the hard lines of the woodcut. Beautiful work! This work of art tells such a story and is beautifully done. The story behind the story is mine as well. Those tapes discarded finally in my early 40's. Now I teach how-to to others. Funny that what drew me to your blog was your beautiful smile and very happy looking face in your photo. Thought you might enjoy knowing that bit of truth. Wow, what a beautiful and wise grandmother. Thank you for giving us this glimpse into a beautiful life.